Mortgage financing giant Fannie Mae launched a healthy housing reward initiative that offers financial awards to multifamily borrowers who provide services that improve the health and well-being of tenants living in affordable housing. These services could range from day care and food access to youth and education programming and job training. The program, dubbed Enhanced Resident Services, includes a lower borrowing rate for purchasers who participate. The program is part of Fannie Mae’s Healthy Housing Rewards initiative, which aims to advance sustainable communities and the availability of affordable housing by encouraging multifamily borrowers to improve design features and services that improve residents’ health and stability. For the program, Fannie Mae is teaming up with Stewards for Affordable Housing for the Future, a nonprofit multistate group of affordable housing providers that offers compliance certifications for borrowers and the multifamily affordable housing property. To qualify for the program, at least 60 percent of the units in multifamily properties seeking the pricing incentive must serve residents earning 60 percent of average median income or less. The program officially started Jan. 15. Mortgage applications for refinancings and home purchases surged 4.1 percent last week on a seasonally adjusted basis, even as interest rates rose, the Mortgage Bankers Association reported Wednesday. Volume is now up 5.6 percent over a year ago. More consumers are growing concerned that the long run of record low rates may be coming to an end. As such, they’re rushing to lock in rates before any more upticks. Applications to purchase a home increased 3 percent last week and are now 7 percent higher than the same week a year ago. Refinance applications rose 4 percent last week. 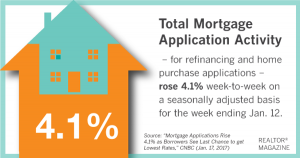 Typically, refinance applications drop when interest rates rise so applications diverted from normal patterns last week. The MBA reports that the average 30-year fixed-rate mortgage rose last week to 4.33 percent, from 4.23 percent the previous week. Interest rates across the board rose last week, including the 5/1 adjustable-rate mortgage, which rose to its highest level since April 2011. What should a seller do if a pre-listing inspection uncovers significant problems in the home? It’s always better for everyone to know about major inspection issues as soon as possible. Once they’re identified, they can be carefully assessed for proper resolution. Depending on the nature of the issue, a seller shouldn’t automatically assume that everything needs to be fixed before putting the home on the market. Their real estate professional should advise whether the repairs are necessary to the viability of the sale. Regardless of who owns the property, issues of concern to the buyer will need to be dealt with somehow, and the associated cost of the resolution is a consideration for both the buyer and seller. What about sellers who don’t see the sense in paying for an inspection? Actually, a pre-listing inspection can ultimately save money for sellers in two ways. First, by being aware of and disclosing known property issues upfront, the seller can make it known that consideration for those items has already been factored into the sales price. That effectively takes these issues off the negotiation table. Second, the seller can choose to repair the issues prior to listing, which gives them more control over repair costs. 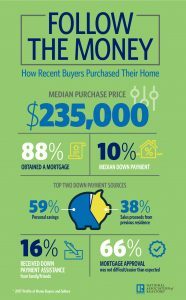 The majority of buyers who obtained a mortgage last year made a down payment of less than 20 percent, according to the National Association of REALTORS®’ 2017 Profile of Home Buyers and Sellers. The median down payment in 2017 was 10 percent, according to the report. The bulk of buyers’ down payments came from their personal savings, but a fraction also came from the sales proceeds of a previous residence or assistance from family or friends. Among first-time buyers, 61 percent made an average down payment of zero percent to 6 percent, according to the November 2017 REALTORS® Confidence Index Survey. This home has more space than it appears on the outside. Main floor has a large living room with a fireplace, two main floor bedrooms and a full bath. Lower level has a huge rec room with a wet bar and fireplace, laundry, .7 bathroom, and the 3rd bedroom (but no egress window). Attached single stall garage plus a 2nd 24×32 garage as well. Central air conditioning, and the brick work is in very good condition. Thinking about buying? Selling your home? Call Perrella and Associates. Range wide service! “I get that lounge chairs are comfortable, but they’re truly the elephant in the room,” Karen Gray-Plaisted, a home staging and decor pro with Design Solutions KGP, told realtor.com®. Huge recliners can cram a space. A matching sofa, chair, and ottoman can make a room appear dull, designers say. “It’s like walking into a sea of wood, which could have looked better with a mix of texture and color if the pieces had been chosen separately,” says Carole Marcotte, an interior designer with Form & Function in Raleigh, N.C. She recommends homeowners buy a few pieces from one furniture set and then mingle in other styles for more contrast. For example, Bee Heinemann, an interior designer with Vant Wall Panels, suggests removing the love seat and replacing it with two chairs from a different collection. Inexpensive pieces that are poorly made or constructed—using materials such as particle board—will chip, fade, and fall apart. These end up costing homeowners more money in the long run. “Buying furniture you plan to replace every few years isn’t smart,” says Sara Chiarilli, owner of the design firm Artful Conceptions in Tampa, Fla. Instead, designers suggest purchasing high-quality, neutral pieces. Then, add pops of color with pillows or other accents.